Low self-esteem can be a large burden for a teenager. Teens with low self-esteem are at risk of being bullied, bullying others, using drugs and alcohol, and having suicidal thoughts. Building up a teenager's self-esteem is a slow and difficult process, but if you're able to identify the factors affecting your teenager's ideas about herself, you'll know where to start. The beginning of puberty can deliver a blow to a teenager's self-esteem. When her body starts to change, she may start to feel self-conscious about those changes and the way she's developing in comparison to her friends. A boy may feel embarassed about being smaller than his friends, while a girl may feel ashamed if her breasts grow large and she begins to attract unwanted attention from older men. As she starts developing crushes on peers, a teenager will become more concerned with her appearance than she was as a child. Comparing her body to the images she sees in the media can also affect how she sees herself; if she's unable to afford the most popular clothing or is larger or smaller than popular musicians and actors, she may feel inferior to both her peers and celebrities. 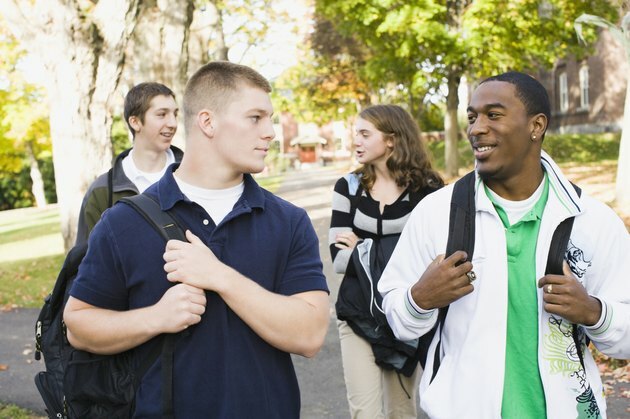 A teenager's home and school life will both affect his self-esteem. If he's raised in a loving and nurturing home and has a close-knit group of supportive friends at school, his self-esteem may be higher than that of a teen who is being raised by critical parents and has few friends. Being teased or shunned by classmates or criticized by teachers can also damage a teenager's self-esteem. If he has a physical or mental disability or belongs to a different race or religion than most of his peers, he may feel embarrassment and shame that can transform into low self-esteem. Some teens won't be bothered by failing algebra, while others will be completely undone by getting a B on a quiz. Beyond school performance, the activities a teen participates in will also affect his self-image, sometimes for better and sometimes for worse. Not being chosen for a team can make a teen feel shame, while being chosen and becoming part of a team can make him feel important and valued. Finding a hobby that he enjoys and is good at can have a powerful effect on a teen's self-image, so encourage him to pursue his passions. Doing community service projects can also boost a teen's self-esteem. No matter how attractive, smart and successful he is, a teenager may be unable to see all his assets and only see his flaws. His perceptions about his place in the world and the things he tells himself will affect how he values himself. Conversely, a teenager who falls into the middle of the pack in terms of appearance and social standing may feel great about himself because he has a positive internal monologue. Teenagers develop these voices and perceptions throughout childhood, so you can't convince a teen with low self-esteem that he's important and fun to be around simply by telling him once. Praising his efforts and providing constructive feedback instead of criticism can, over time, help him change some of his negative self-impressions.